STICKY FINGERS - baking bread on a snow day. 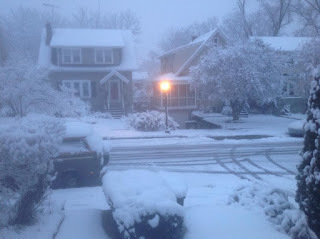 We had a completely unexpected (and unwelcome) snow day yesterday in Louisville. Our Brazilian au pair disapproved of the weather, as did I, but it did yield some pretty photos in my Instagram feed and some delicious food back home. I keep forgetting to as our au pair if I can use her name in my blog, so today I will keep saying au pair, au pair, au pair. I am practicing these words also because I keep feeling bourgeois guilt when I say it. Most people do not understand what an au pair actually is (just like most people do not understand that I actually work -- I shouldn't care, but it makes me insane when my friends think I am independently wealthy or don't put in the hours that they do for their jobs -- I WORK ALL THE TIME, just not the same hours that you do, people!) ... whew, sorry for the digression. Anyway, an au pair, is french for "on par" or "equal to." It's a person who, first and foremost, lives with us and is part of our family. I feel like this only child (me) suddenly has a younger sister with a lot more energy than I have, but just as much love for my kids. We do not have a large house (here is our house, and yes, I'm aware that it's not super smart to put a photo of my house on the internet, but, honestly, I figure that if you're a creeper-stalker-type, then you already know where I live because property info is public record. ), but we have 3 small bedrooms. The boys are in one, David and I are in another, and our wonderful au pair is practically on top of us in the third. We share a bathroom. We are family. She helps with the kids, and wow, has she been a help. I mean, look at me, right now, sitting at a coffee shop, breathing deeply and writing a blog, knowing that my kiddos are getting one-on-one attention and love. It is amazing! Mostly, my exhalation is because I have childcare at all. Angus has been at home with me for the past 2 years because paying for daycare for two children is insanely expensive. It's cost-prohibitive for me to work (yes, an au pair is less expensive than two in daycare! ), and if I don't work, I am a terrible mother and general bad person to be around. 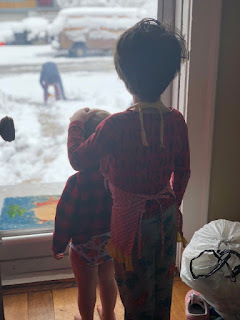 A snow day would normally have set me back into a depressive mode, but with our au pair around, I was still able to work. In fact, I was so productive that I was able to pause to come upstairs and play some games and eat lunch with and bake with the kiddos. Our au pair just whipped out a vegan bread recipe from her brain and two hours later, we were smothering hot, fresh bread with Kerry Gold (well, I was, but wee Angus and our au pair went dairy-free) and inhaling the whisky-smell (bread-baking smells like a distillery -- not the other way around). Look out for more blogs and more cheerful blogs, friends. And haters out there, just stay away please. I need to throw a party for our wonderful Brazilian soon, so you all can meet our new family member! to shovel the sidewalk instead. Holly tree with snow, through the screen window in my kitchen. My house -- credit to Rebecca Renzi for the photo. Nice I could feel the pleasant mood. Obrigado. EDINBURGH - 1-day walking tour!